Since some times I’m building a smart home based on OpenHAB. After playing around with local installation and an installation on the Raspberry PI, I decided to change the hosting platform. I’m running a full-fledged HP Proliant G6 server at home (for some other reasons) which has Debian 8 installed on it. 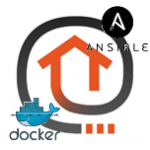 For all systems provisioned, I’m using Ansible and Docker. This article gives some insights in the installation. My Debian host is configured to run as a Docker host – just a straight forward installation using Ansible. To manage that I found a very nice role on Ansible Galaxy called angstwad.docker_ubuntu which I used without any modifications. As you can see, I run Apache as a reverse proxy on the host system and anything else packaged in containers. In order to store data from the Docker container, I decided to provide a directory /data containing volumes which are mounted in every container. This approaches simplifies the backup. Now, after you got my general setup, let me tell you how I install OpenHAB. My experiments started with OpenHAB2, but decided to switch back to OpenHAB1. In doing so, I adopted some ideas from the OpenHAB original Docker file and some ideas from the Ansible OpenHAB role of Prof Falken. Let start with the Dockerfile, which is provided as a j2 template and copied using the template module to the Docker host. Most intersting parts here are the three RUN commands. The first one is installing required packages on the base image. The second one installs GOSU and prepares the OpenHAB installation. The third one is installing OpenHAB and extensions. This is where the magic happens. The idea (of proffalken) is that we can define the actions, bindings and persistence of OpenHAB in the Ansible file and then, iterate over those and generate the openhab.cfg and install the add-ons. I use rsync (in form of a synchronize Ansible role) for managing my OpenHAB files like items, rules etc. The nice story about the docker image is that its creation is executed only once, as long I’m not changing the actions, bindings and persistence. If you have any questions, don’t hesitate to ask me in comments. Have fun and do Ansible!